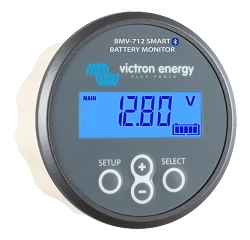 The Victron BMV 712 Battery Monitor works with any brand of battery. The Victron BMV battery monitor gives an accurate state of charge reading by counting charge and consumption and works with any batteries. To work correctly it needs to be set up with the parameters to match the battery in question. Some battery manufacturers supply the recommended parameters but if yours doesnt then you can start using the Parameters for Victron Energy Batteries and then make adjustments. Here are the BMV settings to use with Battle Born batteries Using the latest and most advanced monitoring systems is a big part of a successful Lithium Battery project. In addition to its basic monitoring functions the BMV 712 can be viewed wirelessly on a phone, tablet or computer using Bluetooth technology. It has an alarm function which can be programmed to respond to low temperature (requires optional temperature sensor) or which can be programmed to alarm on high voltage or even on state of charge. The Victron Battery Protect is a relay that can shut off the load from a battery when its voltage gets low. It is programmable and can be used in a variety of ways. 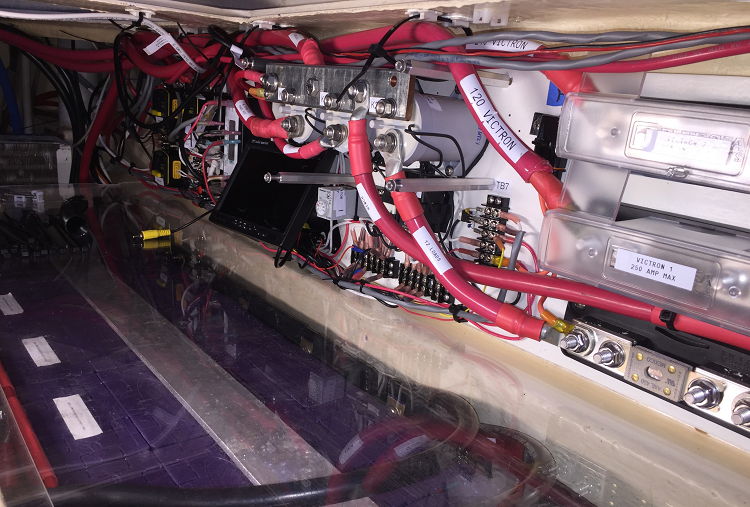 In the Victron integrated Lithium Battery system it can be programmed to operate on the command of the BMS (Battery Management System) to shut off charge or discharge to the battery when it is nearing full or empty. In the Victron system the BMS is monitoring each cell in the battery and can turn off the load or charge if even a single cell is outside the allowed value. If your battery system has an external BMS it can be used in that way too, however even if your battery doesnt have an external BMS or even if you cant access the internal BMS, it is still possible to have the Battery Protect to turn off the loads to the battery as the voltage gets low. The shutoff voltage is programmable in the setup menu. One application for this device is to have it turn off non essential loads before the whole system shuts down so you aren't left in the dark. The greatest difficulty encountered with many of these other brands of batteries is what happens when trying to charge them with an alternator. The problem is that the batteries have such low internal resistance that the alternator can easily self-destruct because it ends up working flat out for extended time periods. The Buck Boost DC DC Converter is specifically designed to get around some of these problems. It behaves as a very sophisticated programmable battery combiner, linking the start battery to the Lithium Battery. Typically it gets used on vehicles such as Sprinter Vans or other small RV's and it limits the current flow from the start battery and so protects the alternator from premature failure. It is designed to be installed with a minimum of alteration to the vehicles wiring and so avoids any warranty issues with the original vehicle. It can be programmed to use its built-in vibration sensor to detect when the engine is running. Its output voltage can be programmed to suit the recommendations of your Lithium Battery manufacturer. Other items may not work or have unexpected results. The following items either dont work at all with other batteries or may have unexpected outcomes. They are not marketed as being suitable for use with other batteries and so you are on your own it you try to use them or adapt them. One person did have some success with one of the items and so I have included his account here. I did a ton of learning and talked to a lot of people like you and at battleborn batteries. In the end this is what I ended up with for alternator charging a lithium battleborn battery in a Ram Promaster van. I ran a 4 gauge wire to a high quality 70 amp auto-reset breaker, then to the cyrix li-ct, then to the 100 ah battery. I used a small piece of 16 gauge wire to connect the bms terminal on the cyrix to one of the large terminal posts on the cyrix. The battleborns have an internal bms so there's no need to have an additional bms. As long as there is any voltage in the battery post you're connected to, it will keep the cyrix 'awake.' That's all that post does. You could also wire it to an ignition-activated wire to ensure that it isolates when the vehicle is off immediately, but that is unnecessary. A drained lithium battery will take just about any amount of current you can throw at it. The test I ran was to drain the battery to 40% capacity. About 12.6 volts. I started the engine and immediately got a 65 amp surge, then it settled at 55 amps. The wire, breakers, cyrix, etc can handle that big load, it's the alternator I worry about. I don't think many people think about the alternator when building an alternator charging system with 150 amp breakers and 0 gauge wire. Even at 65 amps, you can hear the engine idling low and the alternator working really hard. For extended periods of time, this would wear it out and at higher loads could cause malfunction in the vehicle itself. So my theory is that with a 100 ah lithium battery, this system is great. Up to 150 ah system...borderline. I bet repeating the same experiment I did, you'd see a 100 amp surge. Promasters have a 180 amp alternator so it can probably handle it. A 220 amp alternator would be better. But I think if you move up to a 200 ah system (or bigger) it's time to get a dc/dc charger that will limit the current to 25, 40, or 60 amps depending. The next van I'm building, I'm putting in 200 ah lithium bank and using a 25 amp Redarc charger. I got it in the shop and it's a really nice product. Very small, sealed with inputs for alternator and solar (mppt) charging. 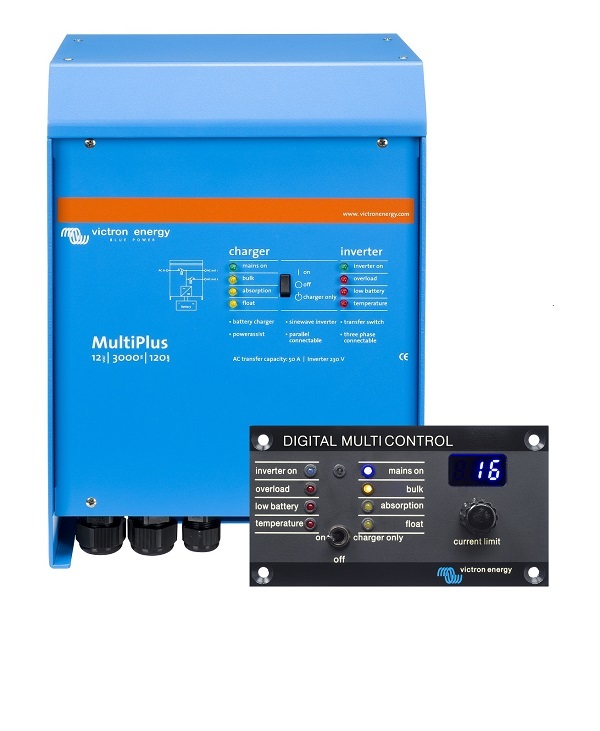 They also make a 40 amp version and just released a 30 amp unit that has inputs for alternator, solar, and shore power (the unicorn of charging devices!) It comes with a battery monitor and costs $1200 which is a bit crazy even though it looks like a great device. The Victron 12/1200 BMS is a Battery Management System designed specifically for Victron Smart Batteries. It has a data cable that connects to the batteries. It has another function though that is the subject of a lot of enquiries; so many enquiries that I was prompted to write this article. It uses a clever method to limit the current flow between the charge source and the battery. The amount of current flowing is adjustable up to 100 Amps and the method of adjusting is rather novel also, it uses the property of a fuse whereby it changes its resistance as it heats up and nears its blowing point. We havent yet established if there is any possibility of using this device with non-Victron batteries. Thes do NOT work with any other brands of batteries, they are specifically designed for Victron Smart Batteries and have a data communication cable with the internal circuitry of the batteries. This is on a 50 ft Catamaran. The batteries use the Elite Power Solutions BMS and 1100Ah GBS LFMP batteries. 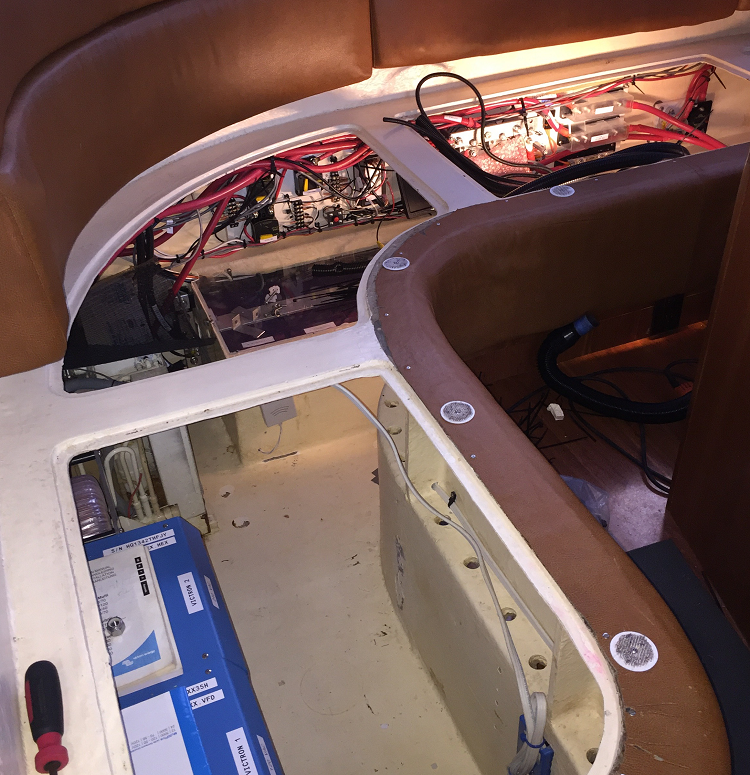 There are five charging sources 1) shore power via the Victrons, 2) genset via the Victrons, 3) 1040W solar, and 4 & 5) two engines each with Balmar AT200s, MC614s and a Centerfielder.